My own fault really, my NaNoWriMo fail. No one to blame but myself. 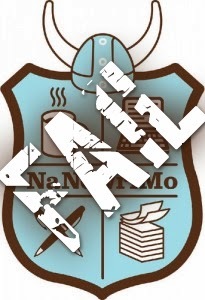 I’ve tried NaNoWriMo in the past, but I didn’t get too far then either, as in keeping up with their schedule. What is nice is if you join the state or local chapter, and they have local writing events but I’ve never been very good at writing in public. Writing for me is a very private affair. I close my door, turn on an air cleaner I have, that makes more noise then an ascending 747. But that’s just me. For others, NaNoWriMo is a solid kick to your writing pants. If you also get on their email list, they’ll send you encouragements to keep you on course. If you keep up with their online site, you have your own page where you log in with your progress every day, putting in your word count. It’s definitely for people who want to keep motivated, plus get you in touch with other local writers. I did write a book in a month once, and you have to be pretty dedicated, but I had a deadline and didn’t have a choice. One takeaway from that month was I learned how to eat really good with one hand! Previous PostLiberty States Fiction Writer’s Annual Conference Registration is Open!Next PostHappy Thanksgiving. Let’s eat!